When buying animals, we recommend that you check out the source. Observe the health of the animals, the sellers’ knowledge, and their reputation and experience. Compare buying hedgehogs to buying strawberries. It is possible to find great strawberries at your local super-store. On the other hand, these strawberries are mass-produced, artificially ripened, and probably do not have the wonderful flavor as some of your other options. The stock person may not be as knowledgeable as other vendors as to how they were produced, the quality, or other information. Another place to buy fruit is from a local fruit market or a roadside stand. These markets can be more selective in the quality and freshness of their products. This retailer tends to have more invested interest in you as a customer and is probably a little more educated in the product. Finally, you can go to a strawberry farm and pick your berries yourself. Your tasty treat may be a little more difficult to obtain, will take more work, but you will have a completely different product in the end. Purchasing animals should not be a matter of convenience and lowest bottom dollar. It may be well worth going out of your way to select a hedgehog that is right for you. Many people have their first introductions to hedgehogs through a pet store. We hesitate to label pet stores as “bad” without visiting the store and talking to the owner. However, many pet stores do not have the same knowledge and experience you can get from a breeder. We will not label all breeders as “good” simply because they are breeders. You may have to do a little work to find a suitable breeder in your area. We firmly believe that it would be well worth your time and energy to travel so that you might have a good buying experience, rather than to buy from a less suitable breeder or dealer simply because they are closer. The person you are buying from should know the age and background of the hedgehog. You should have the confidence that this person keeps his/her animals clean and well maintained. Your new hedgehog should be eating a quality diet. The salesperson should be able to easily demonstrate proper handling techniques and be able to physically show you the gender of your hedgehog. You should be provided accurate information on how to properly care for and maintain your new pet. The animals should be housed according to gender and never buy a female that has been housed with a male. Females can breed as early as eight weeks but should not be bred until they are much older. Early breeding can cause complications for both the mother and the babies including cannibalization of babies. Breeding and selling hedgehogs is a lot of work. Much time, effort, and expense is necessary to care for the animals as well as to market and sell the babies. Many people assume “there must be a good market for hedgehog babies because there aren’t many around”. We believe the opposite is true. There aren’t many around because the market for them is relatively small compared to typical pets. The average pet hedgehog is much more expensive than the average pet guinea pig, hamster or rabbit. Hedgehogs are exotic animals; exotic or rare animals of all kinds are typically more expensive than average pets or livestock. Hedgehogs have unique care and handling requirements. A good breeder or retailer will spend a considerable amount of time educating their customer about these requirements. Part of the price of an animal is the time required to breed and sell that animal. Hedgehogs are relatively expensive to breed and sell. Very few breeders or retailers are willing to raise animals at a loss and so their expenses are reflected in the price of the animal. Exotic animal breeders and retailers are required to have a USDA license. This license requires additional time, effort, and expense on their part. Again, those costs must be passed on in the price of the animal. We encourage NOT buying an animal either from a breeder or a pet store as a “rescue” to remove it from terrible conditions. Purchasing the animal may improve that particular animal’s condition, but it will not prevent future animals from being housed or maintained in similar situations. Instead, kindly and respectfully point out the problem to the owner or manager and try to educate the person or store about proper hedgehog care. Some instances of neglect are not from intent but from lack of information. It may be necessary to notify the proper authorities should the situation not improve. 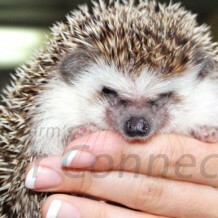 Hedgehog sales are governed by the USDA, which is obligated to investigate all complaints.